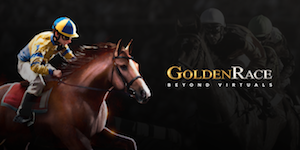 In this latest viewpoint, Golden Race talks about the improvements it has made to its popular 3D horse racing product. Golden Race's 3D Horses have undergone a great transformation. The evolution is due to the great improvements carried out at the graphical and visual effects level. Golden Race 3D Horse Races were already good, but now they are unsurpassable. They offer the most realistic experience in the market! Real backgrounds have been shot and integrated with the latest cinematographic techniques in real time with virtual 3D horses and jockeys. In addition, animated muscles and tendons have been used on the surface, something that you will not find in any current product, as well as the use of a fabric system. Likewise, high-resolution 3D scans of both horses and jockeys have been carried out using state-of-the-art 3D scanners. For the visual appearance of the 3D surface, technically known as “PBR Shaders”, a short hair system has been used, which gives a very authentic look to the real horse’s coat. The same motion capture systems used in blockbusters such as “Black Panther”, “John Carter” and “Paul” have been used to capture real horses’ motion. The company has also used motion analysis with high-speed 2000FPS cameras and real physical effects have been achieved for grass, soil and sand impacts. Golden Race's races are created using a hybrid system of artificial intelligence and reproductions of real races. The best are chosen and added to a database while simulation and effects are processed in the background. After all these improvements, it is more than clear that Golden Race is one of the best options for betting shops thanks to its spectacular display of 3D graphics of horse racing that provides a unique experience of real racing. UK licensed virtual sports developer Golden Race is always innovating and investing in new technologies to offer the best virtual games products in the sports betting industry. The company promises to keep improving its online platform as well as developing new thrilling 3D sports and games. In fact, this year, Golden Race has been nominated for five SBC Awards including ‘Best Live Streaming Product’, ‘Best Retail Betting Product’, ‘Best Virtual Football Product’, ‘Best Virtual Sports Product’, and ‘Best Virtual Sports/Game Innovation’.